Still being a working convent, you're likely to bump into the occasional nun walking around the courtyards. 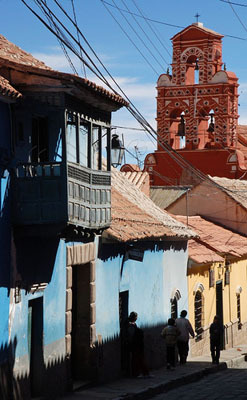 Happily, the Santa Teresa also opens its doors as a museum, celebrating Potosi's religious and colonial history. The building is absolutely beautiful, divided internally into two idyllic courtyards which are surrounded by the museum space on ground and first floors. Be sure to note the simplicity of the architecture, which draws a lot more heavily from the Spanish style than many buildings in Potosi. Among the exhibits contained within are a collection of organs and musical instruments used for worship, a great deal of paintings depicting saints and martyrs, a room of keys and locks and another filled with rather graphic sculptural portrayals of Christ at the Crucifixion. There are countless rooms, however, and it would be easy to get lost or miss something without the tour guide (included in the price of entry).